Australia’s Great South West Walk (GSWW) has got everything going for it. The easily accessed 252km (156-mile) loop trail runs between Portland and Nelson in Victoria, the most southeastern state of Australia’s mainland. It’s logistically simple and it’s pleasant hiking. The campsites are clean, the wildlife is plentiful, and the landscape is superb. There’s eucalyptus forest with stretches of blowdowns for climbing over and crawling under. Crashing Southern Ocean beaches and giant sand dunes. A broad river gorge, cliffs, sheltered bays, and lakes. 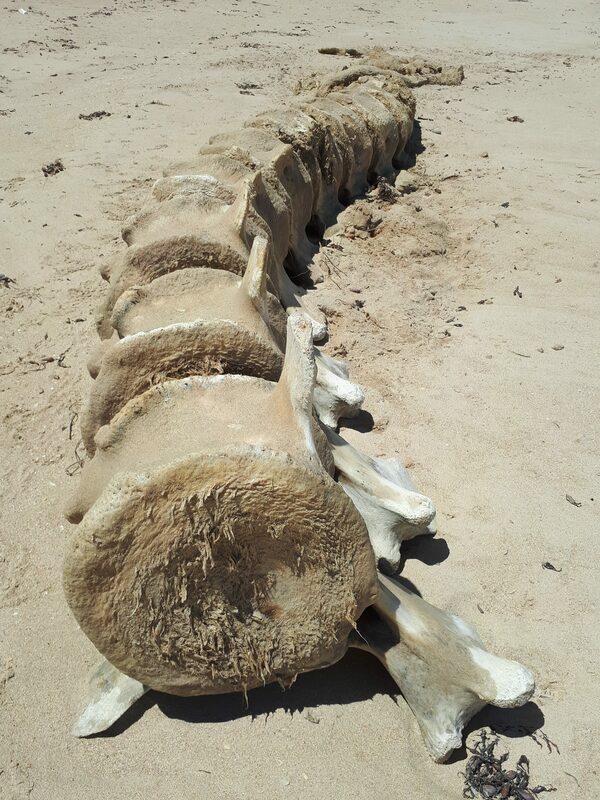 It’s the only trail on which I’ve found whale vertebrae. And when I hiked it in early December, there weren’t many people. The GSWW is usually hiked anticlockwise from Portland, Victoria’s oldest European settlement. The guy at the Portland Visitor Information Centre, the trail’s start, says this is something to do with tides but I suspect it’s more to do with leaving the harder sections to last. 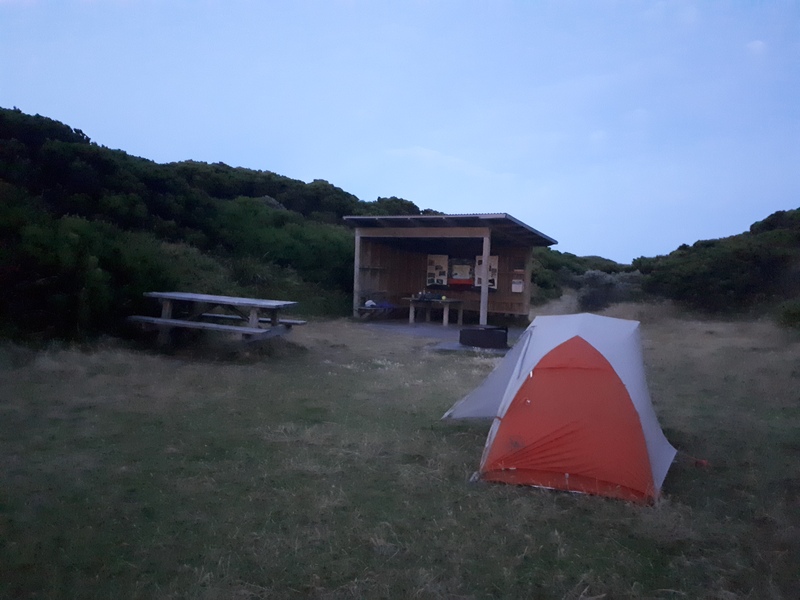 Mostly it’s relaxing, flat hiking, but I find long beach sections a real slog and going anticlockwise means I hit them later when I am fit rather than sooner when I am less so. 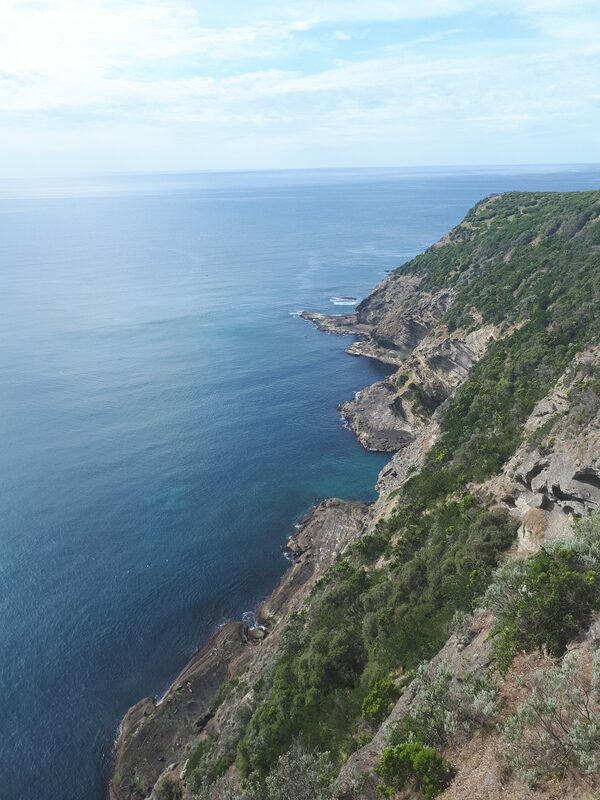 The trail follows the coast out of Portland, then turns inland through Cobboboonee and Lower Glenelg national parks. It follows Glenelg River, loops back to Nelson, and travels along the beach and cliffs of Discovery Bay Coastal Park to Cape Nelson lighthouse before returning to the visitor center. Stated distances between camps are rubbery and my official map proved prone to disintegration. This is what it looked like within days. 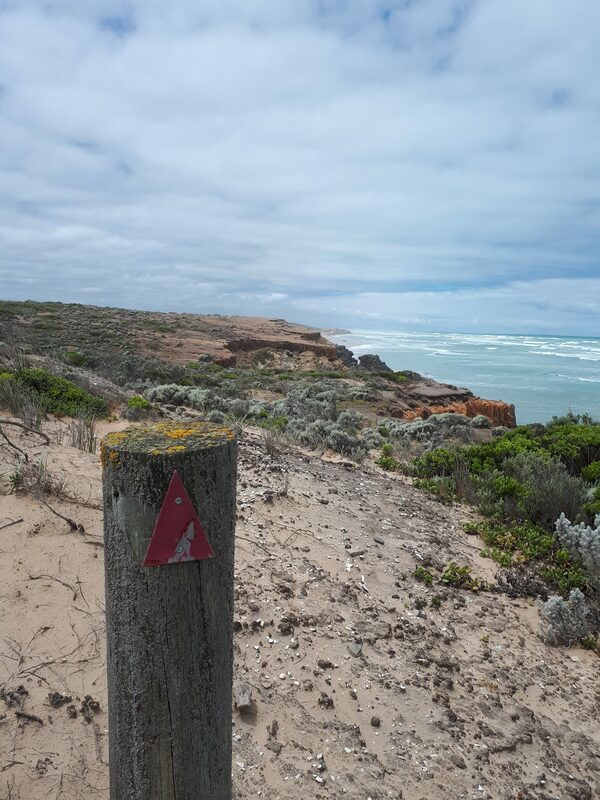 The trail is marked by red triangles, which are mostly easy to follow, except for a few on the beach, which I found hard to spot in the dunes but you might not. On Bridgewater Bay I backtracked four kilometers on sand, thinking I had missed the marker because I was tired and had a heat-fried brain, and under these conditions I might not be as patient as I should be. 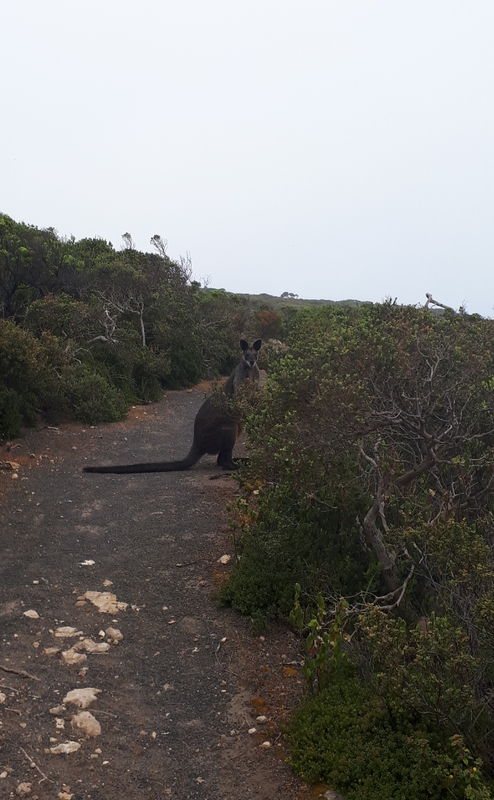 Dedicated GSWW campsites are spaced ten to 23 kilometers (six to 15 miles) apart and on all but two nights it’s just me and the kangaroos at camp. Each site has a picnic table, a shelter to sit in, water, and plenty of space to pitch tents. Most camps require payment and this covers the cost of keeping them beautifully maintained. I stay in the camps apart from my second night, when an old injury returns to stop me from getting to one. Instead I pitch my tent on the trail once I find a spot where no tree limbs will drop on me. Even when it feels like someone is stabbing me in the leg I sleep fantastically out here. For lovers of wildlife this trail is incredible. 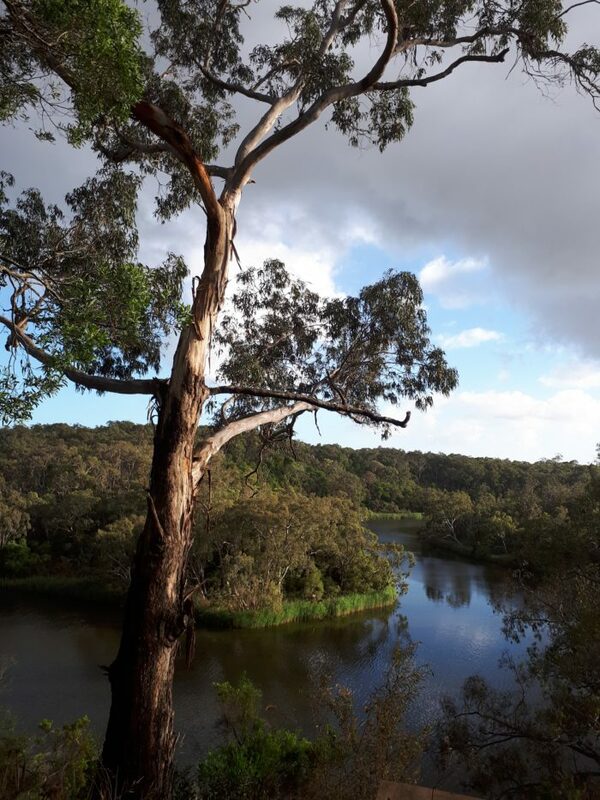 There are red tailed black cockatoos, blue tongue lizards, koalas, kookaburras, crimson rosellas, emus, and a gannet rookery. Every day I see kangaroos and wallabies. We startle each other on the trail and often I wake to them staring at my tent. Echidnas are one of only two egg-laying mammals (the other, the platypus) and they’re so damned cute. On the Gorge Walk section I spend ten minutes watching one push at the soil with its snout and dig with its strange backward feet. The trail runs along the cliffs above two seal colonies outside Cape Bridgewater. The interpretive signs tell me I am looking at New Zealand fur seals to the right, Australian ones to the left. Apparently the two colonies never mix despite being neighbors. Seals are stinky but they’re fun to watch. The morning I am there the Aussies are being noisy and fighting with each other like it’s closing time after six o’clock swill. The Kiwis are proving why everyone loves New Zealand, just sunbathing quietly on their rock shelf or swimming about looking for fish. I treat all snakes like they can kill me because here in Victoria they usually can. Pushing through overgrown trail is a slow affair and there are stretches by Lake Monibeong and Mount Richmond where I hike for kilometers stabbing my poles out in front and stomping my feet in the hope that any snake will bugger off before I get there. 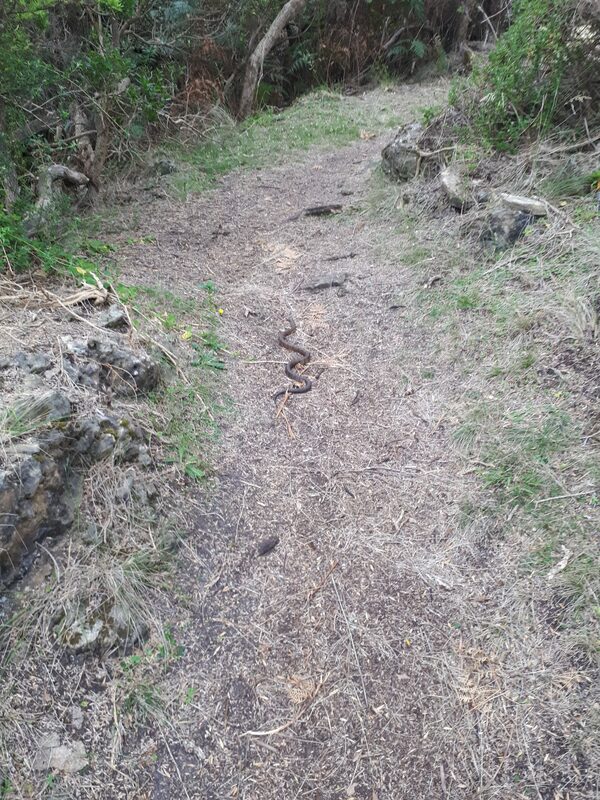 Through the Enchanted Forest, a lovely shaded section cliffside on Nelson Bay, I round a corner and come too close, which to me is anything less than five feet, to stepping on a small tiger snake. 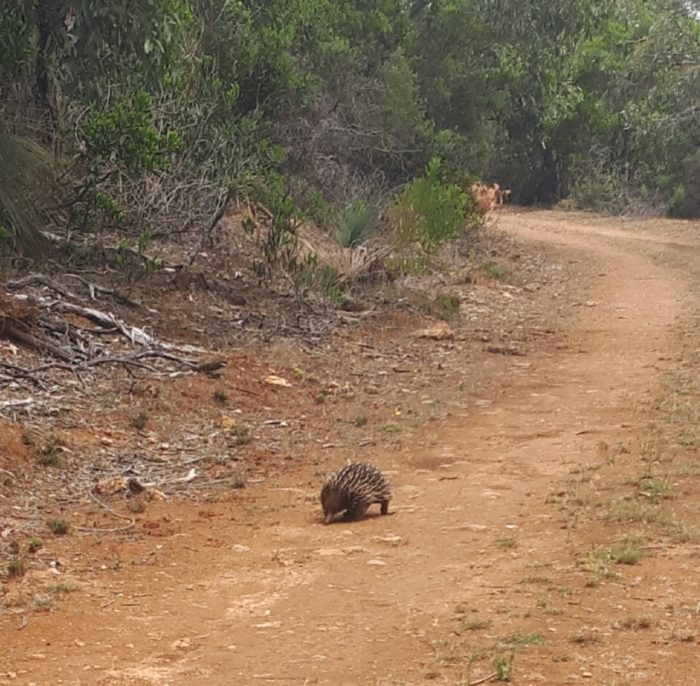 I follow it along the trail, at a distance, for a minute or two until it gives me a break and disappears under a bush. It pays to look down when you’re hiking in Australia and all up I see seven snakes, a ratio of one to every 35 kilometers. There are ticks here and leeches too in sections of swamp that are not wet but might be in winter. For whatever reason I don’t get either ticks or leeches on me but I meet Cliff, who does. The leeches love him. Cliff’s legs are a patchwork of different sized Band-Aids and every time he removes one he bleeds like crazy. Long pants, Cliff. Long pants. There is plenty of road access to the trail but don’t expect to see many vehicles. Some hikers drive out supplies to hide in the bush along the way but I drop a resupply to the general store in Nelson, at around about the halfway point, instead. The store does food—fish and chips, sandwiches, and the like—and so does the nearby roadhouse and, on some days, the pub does too. 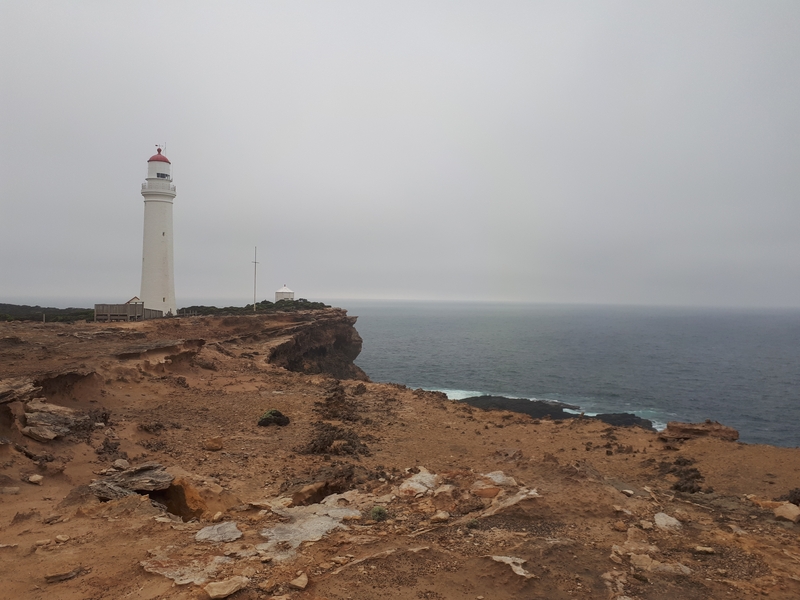 Around 40km from the trail’s end there’s a cafe at Cape Bridgewater. And Cape Nelson State Park, just before Portland, has a restaurant that is rumored to be open sometimes. 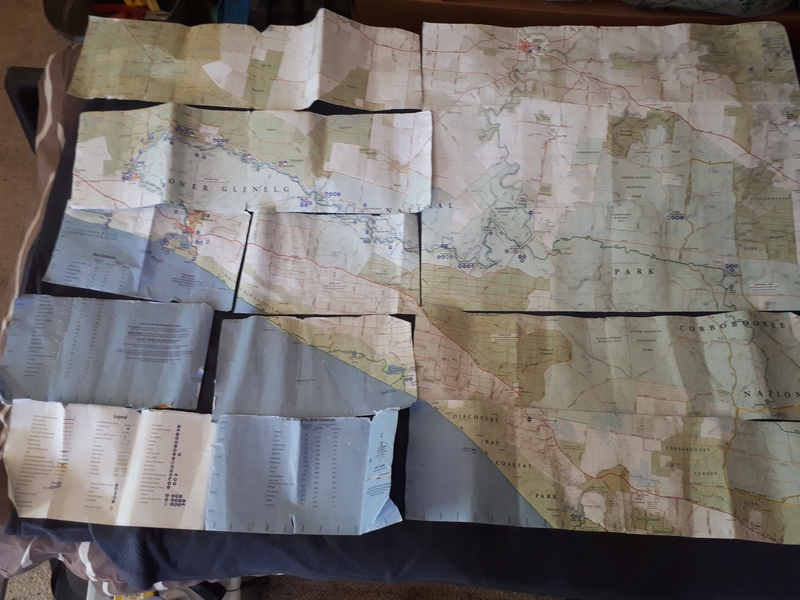 I allocated ten nights, 11 days for the hike and this included a zero in Nelson. Sometimes the “gotta make miles” mentality of thru-hiking is hard to shake, especially when you’re hiking solo. I missed staying at some very pretty camps, like Pattersons. This is the sort of hike I’d like to take time over and will do it again but allow 14 days. The Great South West Walk begins and ends in Portland, Victoria. The official website has details of campsites and distances and an excellent video that will make you want to hike. Portland is accessible from Melbourne by public bus. I drove there and stayed with these wonderful AirBnb hosts, who let me leave my car for the duration of the hike. True trail angels, these folk. Campsites can be booked with Parks Victoria. Check tide times for the beach sections here. Drop Bear you don’t have to hike them all! But as long as you do, I will cheer from afar. You just HAD to include snakes, huh? If you ever want a “face your fear” experience Sam, I have the hike for you. Until then, I will gratefully accept the sideline cheers. Thanks. Dropbear, I am loving following your posts & putting the ones with wildlife on my wish list. You are my hero. Can’t wait to catch up with you. Thanks Palomino. Hope we get to hike together again in the spooky woods soon.